All of my items are hand printed and inspired by all things nature. I use only super soft apparel and soft feel water based inks for the best combination of wearable art. Geometric Bee Tank Top - Gold/mint (from top) on AA tanks - Apiary. Hive. Hexagons. Queens, workers and drones. Pollinators. Bee keeper. Passion Flower Leggings - Lilikoi mandala - gold/ghost print - vines, leaves Passion Fruit leggings. Mandala Leggings. Boho Yoga leggings. 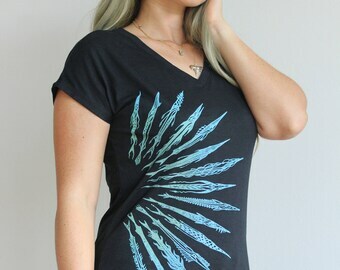 Needlefish women's shirt - comfy sizing Vneck - Rays of sunlight geometric v neck. Diver top. Scuba. Intricate fish shirt - Blue/gold print. 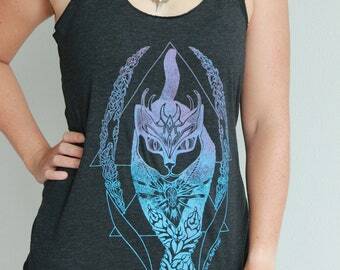 Norse Mythology Tank Top - Yggdrasil tree of life + Midgard Serpent top - Black print on AA tanks- Lynx, Bear, Deer top. Geometric compass. 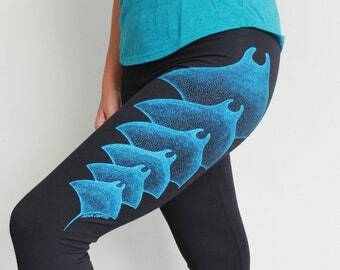 Manta Ray Leggings - Intricate pattern yoga leggings - Blue screen print on 4 colors - Yoga leggings. Activewear. Boho geometric leggings. 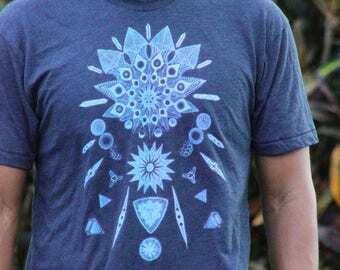 The Keeper of Fire Tee Shirt - Nature's geometry shirt. Hawaii Volcano shirt. Gold/red print on soft shirts. Phoenix. 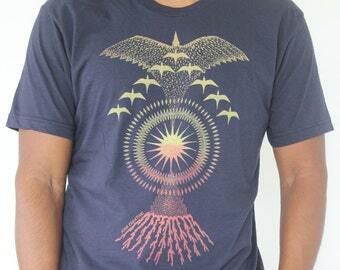 Sun Mandala tee. Divine Owl and Moon Phases Burnout Combo Women's Longsleeve - Geometric symmetry feathers. Pueo. Owl longsleeve top - mint/dark blue print. 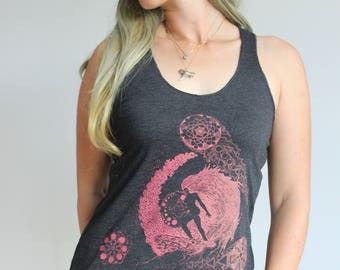 Honey Bee Keeper Tank Top - Tan screen print on AA womens tank colors. Geometric Hive. Queen, worker, drone bees. Flower Sacred Geometry. 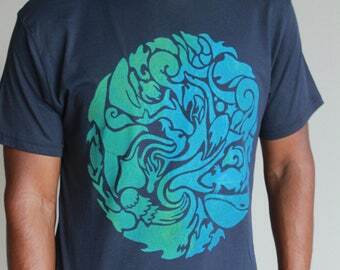 Koa Tree of Life Shirt - mint/dark blue screen print on soft shirts. Fractal tree shirt. Full moon t-shirt. Organic design. Hiking tee. 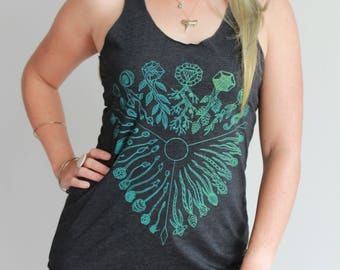 Seeds of Life Tank Top - comfy fit - Plant based botany shirt. Sacred geometry tank top. Boho yoga top. 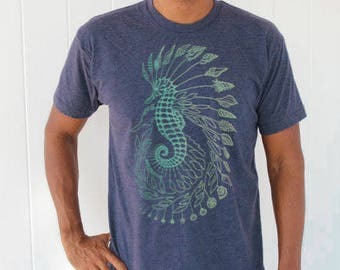 Organic design - Mint/gold print. 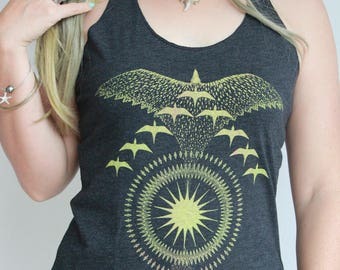 Maui Mythology Bird Tank Top - looser fit - Phoenix V formation Geometric Sun top. Fire Elemental shirt. Boho Yoga apparel - Gold/red print. 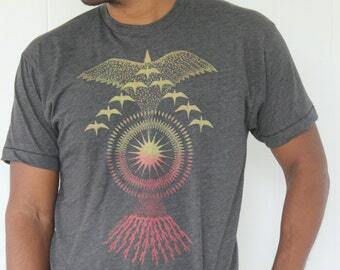 Moon Phase Owl Top - Flowy Looser fit - coral/gold print - Sacred geometry. Intricate wings top. Owl shirt. Moon tank top. Boho yoga tank. Kumulipo Ocean Planet Tee Shirt - blue/gold print - Polynesian Mythology nautical mandala. Subnautica. Deep sea creature tee. Beach shirt. Hawaii Island Unite Tank Top - Gold print on AA tanks - Big Island. 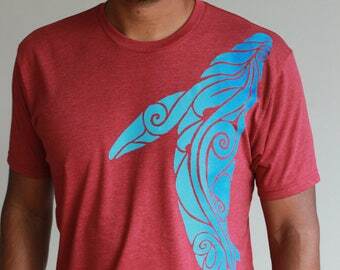 Hilo Hawaii Shirt. 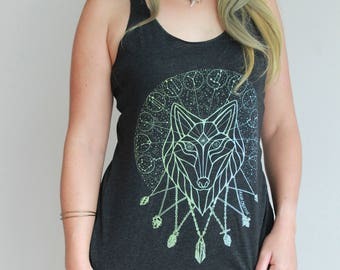 Inner Strength tank top. Kamehameha top. Yoga wear. Magic Lotus Yoga Leggings - Dragonfly, Hummingbird, Boho, Monarch Butterfly leggings. Bohemian leggings - Coral/gold print. Magic Lotus V-neck shirt - loose fit- ghost/mint print- Humming bird v neck top. 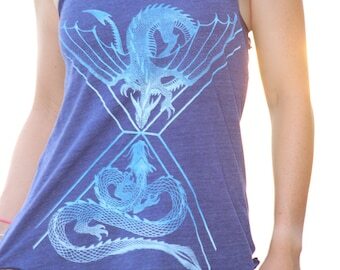 Geometric dragonfly top. Lotus shirt. Chakra women's shirt. Bee Keeper V Neck women's shirt - gold print - loose fit sizing - Bee Hive with innate geometry and floral patterns. Geometric bee shirt. 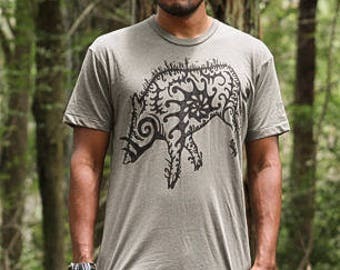 Wild Pig Shirt - King of the Forest t-shirt - Black Screen print on soft shirts. Hawaiian Plant shirt. Ecosystem. Mononoke shirt. Kamapua'a. Very fast shipping, the leggings are soft and the prints and color pretty! Merci! Magic Lotus Leggings - Dragonfly, Monarch Butterfly, Hummingbird leggings - Blue/Red screenprint on 4 colors - Yoga leggings. Activewear..
You guys have the best waist bands!!! I dont know why all tights have to come with a strangling scrunched elastic waist choking your organs. These tights do not. The elastic is flat not scrunched and is all u need to keep them up. This is the second time i bought these exact tights. They are good quality but i wore them so much they eventually needed replacing love them! Seahorse Yoga Leggings - Leafy sea dragon and Seashells leggings. Boho Geometric leggings. 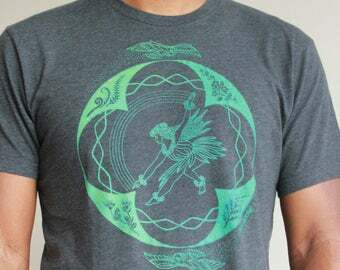 Ghost/mint print on 4 colors. Bohemian leggings. Love the fit, color & print. I love Passionflowers! Will be ordering more from this artist! Lilikoi Passionfruit Women's shirt - comfy sizing- gold/ghost print- Intricate flower top. Natural geometry shirt. BOHO. Vines and fruit. The idea of creating something new with just a pen stayed with me through the years. My business came from wanting to wear concepts of nature that told a story, not with words, but a more universal language. I tried many different methods of screen printing but none had the look I was striving for. I wanted subtle blends of colors, causing my storied designs to turn in space, vibrant but quiet, intricate but visible. Eventually I realized I had to think up my own method of screen printing that worked for me. Five years later I am still having fun with what I do. I am so thankful to the etsy community for allowing me to make a living doing what I love! Due to the effort and investment in making each hand printed item I only accept exchanges if there is something wrong with the product itself. We provide accurate size measurements for each style in hopes that the correct size will be selected. The best color combinations are the ones being worn by the model in the product photos so selecting other color combinations are considered custom items and are not refundable or exchangeable. Please write me a conversation if there is something wrong with the product and I will help resolve the issue. I will not be responsible for loss or theft of a package. I print, pack, and ship most days of the week. Most orders are shipped out within 3-5 business days after your order is made. Every now and then I get a little backed up, so please let me know if you need your order sooner.